These small little muffins are packed with bold but balanced flavors! Juicy sweet blueberries get complemented with the fresh sharpness from candied ginger and a little zing from the lime. Whenever I treat myself to muffins it’s usually the ones that are filled with blueberries. The little berries keep the cupcakes extra moist and delicious. I wanted to give blueberry muffins an extra little twist. That’s where the lime and the ginger come in. 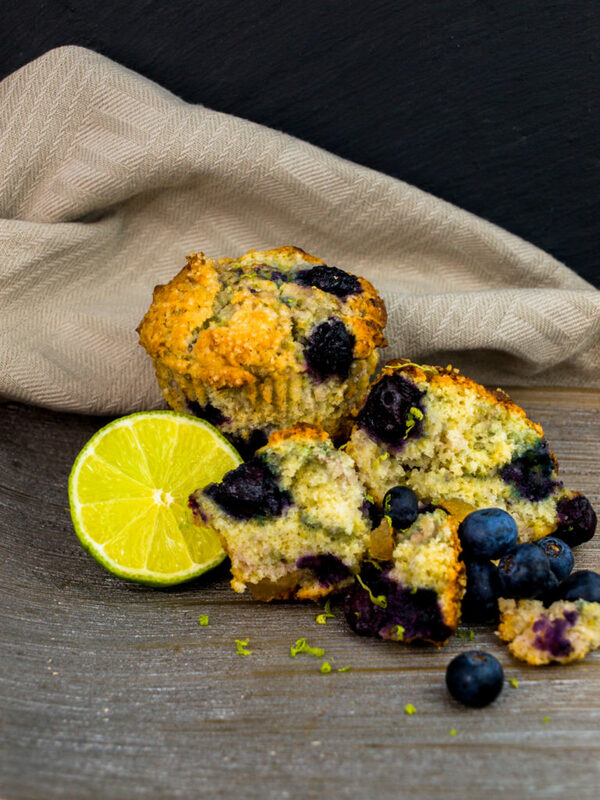 The lime makes the muffins just a bit fresher and counterbalances the sweet taste of the sugar. (The buttermilk in the recipe helps in doing this as well). The candied ginger, on the other hand, gives them a warm sharp edge and rounds the cupcakes off nicely. As with all foods –and life in general- it’s all about balance! In this recipe, I use “stem ginger”! Stem ginger are small little balls of young ginger root. They have the same zingy fresh ginger taste without being as fibrous and woody as their bigger raw counterparts. Because they come in a jar in sweet syrup their taste is also mellower and blends together ever better with other ingredients. If you can’t find stem ginger, normal ginger will do as well, but you might want to add a little extra sweetness with a tablespoon of honey. Preheat the oven to 190°c (fan works best for a crunchy top-crust). Whisk the butter together with the sugar until creamy and well combined. Using a hand mixer is easiest in my opinion. Add the eggs and mix until combined. Add the baking powder, baking soda, half the flour, and half the buttermilk. Mix until well combined again, before adding the second half of the flour and buttermilk. Roughly chop the stem ginger balls into small chunks. Grate the skin of the lime and juice them. Add the juice and zest of the lime, the ginger chunks as well as the blueberries to the dough mixture. Mix once until well combined. Line your muffin tray with paper cups and spread the dough mixture evenly among the cups. Sprinkle the dough with the brown sugar and then bake the muffins in the oven for about 30 minutes until nicely browned on top. Let your muffins cool until they are lukewarm. Take a big bite and get surprised by all the flavor that is packed into the little cakes! Have you ever tried blueberry muffins with lime or ginger before? What other crazy food combinations do you love? Share your thoughts and suggestions with us in the comments below! PS: This recipe is inspired by the idea that blueberries share chemical flavor compounds with ginger and lime. That’s why they work so well together. Check out James Briscione’s book The Flavor Matrix on food pairing if you are interested in digging deeper into this!